The crisis in Kilanga helps the characters unlock some of their secret thoughts and passions. Here, for example, Anatole finally admits what Leah had already suspected about him: he doesn’t believe in God at all. Leah is inspired to ask Anatole, point-blank, about his politics. She points out that he’s involved with the Jeune Mou Pro, and asks him if he believes that violence is necessary to achieve peace. Anatole tells Leah that she’s too young to understand the truth about the world. He tells her that she and her family should never have come to the Congo. The other villagers support the Prices at all times: even now, the villagers are rowing Nathan across the river, and for the last few months, the neighbors have been placing extra eggs in the Prices’ chicken house to feed them. This chapter is full of revealed secrets. Here, we see a rule of life in Kilanga: the villagers must take care of guests, but never admit what they’re doing. Anatole can’t stand to keep up the charade any longer, particularly because Nathan has been so contemptuous of Kilanga’s people. For this reason, he reveals that the Prices have been dependent on the villagers for months now. Suddenly, Leah begins to cry. She says, “I love you, Anatole.” Anatole replies, “Don’t ever say that again.” Leah notes to herself, “I never will.” Two days later, the Prices return to their home to find that the ants have devoured the chickens, leaving only their bones. Anatole certainly seems interested in Leah, and yet he’s unwilling to reciprocate her love—perhaps because he feels it would be too dangerous for them to be together. Nevertheless, everything is on the table now—in fact, the spectacle of chickens stripped to the bones might be intended to reflect the way Anatole and Leah have had the truth laid bare here. Arn, Jackson. "The Poisonwood Bible Book 3, Chapter 48." LitCharts. LitCharts LLC, 29 Jun 2016. Web. 20 Apr 2019. Arn, Jackson. "The Poisonwood Bible Book 3, Chapter 48." LitCharts LLC, June 29, 2016. 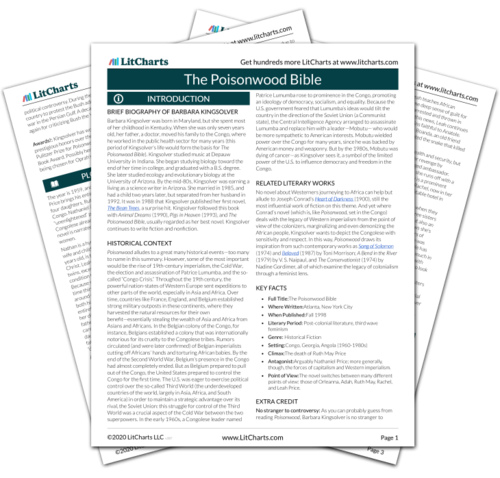 Retrieved April 20, 2019. https://www.litcharts.com/lit/the-poisonwood-bible/book-3-chapter-48.